Less than a week after he set the release date, Travis Scott's long-awaited Astroworld has arrived, and you can hear the entire thing right now. Astroworld runs tracks in length and features appearances from Drake, Frank Ocean, Migos' Quavo and Takoff, Pharrell Williams, John Mayer, Thundercat, 21 Savage and even Tame Impala (who get a production credit). 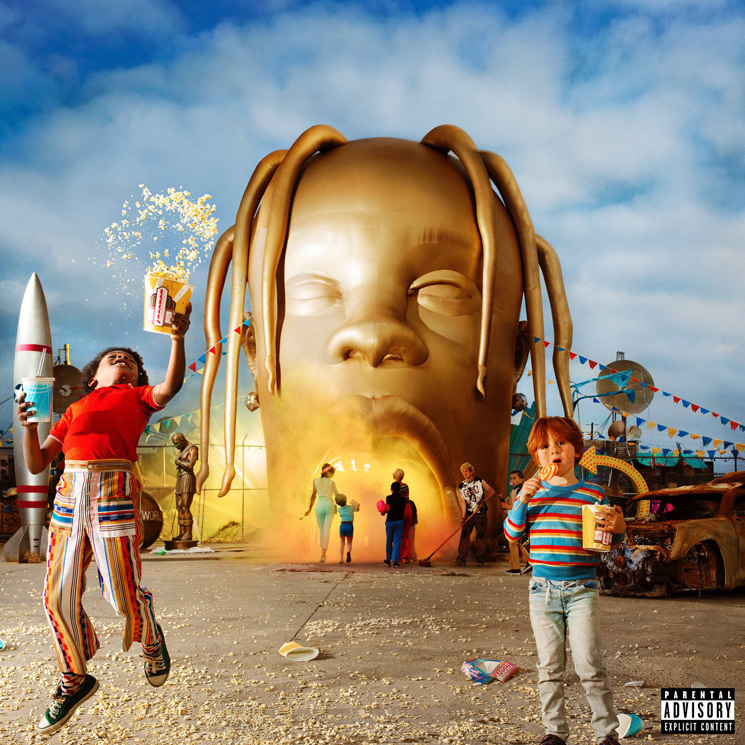 Astroworld's cover art, seen above, was teased with the same golden larger-than-life Scott heads appearing in public life. The first was spotted atop the iconic Amoeba Music in Hollywood, while others appeared in Houston and New York City. UPDATE (8/3, 3:30 p.m. EDT): Travis Scott has now shared a trio of non-album tracks — "Part Time," "Zoom" (ft. Gunna) and "Houdini" (ft. Playboi Carti) — during his Beats 1 show for Apple Music. If you're a subscriber, you can hear them all over here. Scott's last solo full-length was 2016's Birds in the Trap Sing McKnight. Last year, he teamed up with Quavo to deliver the collaborative Huncho Jack, Jack Huncho. This year, Scott has appeared on tracks with Rae Sremmurd, Playboi Carti and NAV.